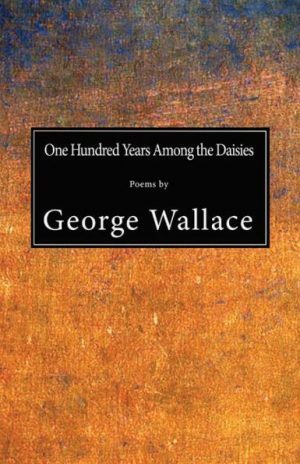 One Hundred Years Among the Daisies, poems by George Wallace. Published by Stubborn Mule Press, 2018. I have this notion that the chunk of time we’re going through in ‘our’ American culture, under Mr. Trump, is somewhat akin to the bad side of the ‘50s. There is a great fear of being different in any meaningful way, combined with a tsunami of forgetting. This forgetting is probably caused, to some degree, by the internet, because computers take away the necessity of personal memory. And there seems to be a fear of real love as well. George Wallace’s work is a bridge over all of that, or a tunnel through it. Wallace’s bridge is akin to Walt Whitman’s attempt to bridge the sadness in this land after the Civil War – a search for what is life affirming. sweet lives returned to the living. I absolutely recommend this book. It is not only enjoyable and moving, it is a pulsating map that guides the reader through this strange time we are now living in – it is that person who sits down beside you in your neighborhood bar and buys you a white Russian, and then tells you the story of their life. George’s work is always elegant yet touchable, and feelable and he never ever disappoints. He must certainly be one if not the best poet of our time. I would like to buy this. How do I do it? Thanks for publishing his work.